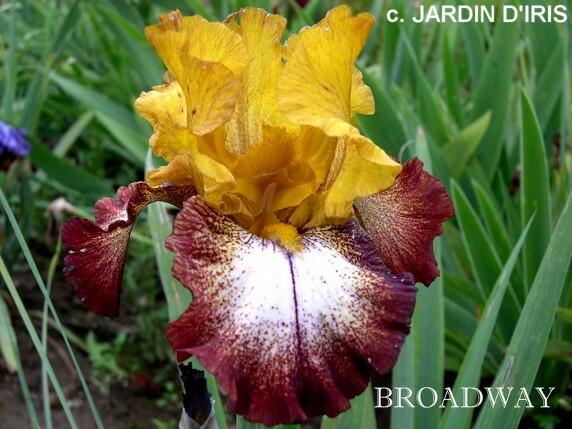 From Keith Keppel Iris catalog, 1981: BROADWAY (Keppel '81) EM 34" (((((Irma Melrose x Tea Apron) x ((Full Circle x Rococo) x Tea Apron)) x April Melody) x Caramba) X Flamenco) By far, the most spectacular variegata-plicata we've yet seen. Dark, deep gold standards top ivory white falls that are broadly banded with red brown. Large flowers with average to good branching -- but always a show-stopper. We predict a long run for this production. #75-103D 25.00.
jpg broadway01.jpg manage 42 K 26 Nov 2018 - 04:03 Main.TLaurin Photo by Iriszkert Szasz-Hungary. jpg broadway02.jpg manage 43 K 26 Nov 2018 - 04:04 Main.TLaurin Photo by Iriszkert Szasz-Hungary. jpg broadway1.jpg manage 45 K 18 Nov 2018 - 20:08 Main.TLaurin Photo by Iriszkert Szasz-Hungary.